In 2014, following the isolation of two-dimensional phosphorene, which is the phosphorus equal of graphene, over 100 theoretical studies have projected that new and stimulating properties could materialize by creating narrow “ribbons” of this material. These properties could be very beneficial to a range of industries. 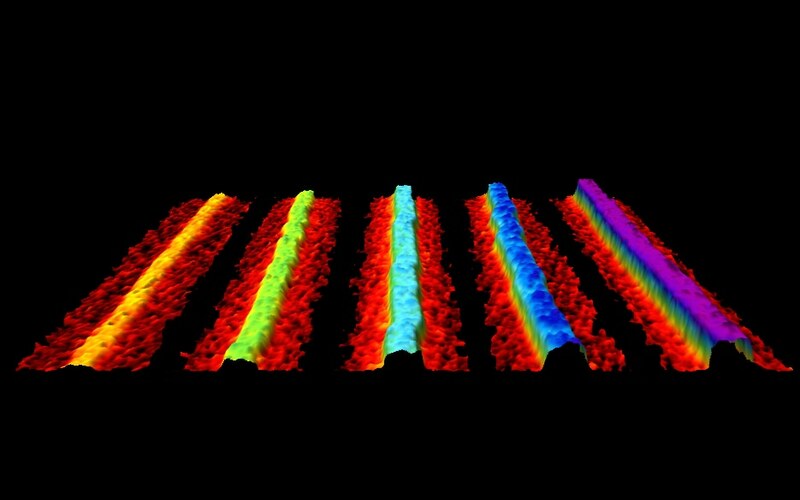 In a research published recently in Nature, scientists from University College of London (UCL), the University of Bristol, Virginia Commonwealth and University and École Polytechnique Fédérale de Lausanne, explain how they developed quantities of superior-quality ribbons of phosphorene from crystals of lithium ions and black phosphorus. “It’s the first time that individual phosphorene nanoribbons have been made. Exciting properties have been predicted and applications where phosphorene nanoribbons could play a transformative role are very wide-reaching,” said study author, Dr Chris Howard (UCL Physics and Astronomy). The ribbons form with a standard height of one atomic layer, widths of 4–50 nm and are up to 75 µm long. This aspect ratio is equivalent to that of the cables spanning the two towers of the Golden Gate Bridge. By using advanced imaging methods, we’ve characterised the ribbons in great detail finding they are extremely flat, crystalline and unusually flexible. Most are only a single-layer of atoms thick but where the ribbon is formed of more than one layer of phosphorene, we have found seamless steps between 1-2-3-4 layers where the ribbon splits. This has not been seen before and each layer should have distinct electronic properties. Mitch Watts, First Author, Physics and Astronomy, UCL. Although nanoribbons have been produced from a number of materials such as graphene, the phosphorene nanoribbons made here have a better range of lengths, heights, widths, and aspect ratios. Furthermore, they can be made at scale in a liquid that could then be used to apply them in volume economically for applications. The researchers state that the projected application areas include solar cells, batteries, thermoelectric devices for transforming waste heat to electricity, nanoelectronics, photocatalysis, and quantum computing. Furthermore, the arrival of exotic effects such as spin density waves, novel magnetism, and topological states have also been predicted. The nanoribbons are created by blending black phosphorus with lithium ions dissolved in liquid ammonia at -50 °C. After twenty-four hours, the ammonia is removed and substituted with an organic solvent which makes a solution of nanoribbons of varying sizes. We were trying to make sheets of phosphorene so were very surprised to discover we’d made ribbons. For nanoribbons to have well-defined properties, their widths must be uniform along their entire length, and we found this was exactly the case for our ribbons. Dr Chris Howard, Study Author, Physics and Astronomy, UCL. At the same time as discovering the ribbons, our own tools for characterising their morphologies were rapidly evolving. The high-speed atomic force microscope that we built at the University of Bristol has the unique capabilities to map the nanoscale features of the ribbons over their macroscopic lengths. We could also assess the range of lengths, widths, and thicknesses produced in great detail by imaging many hundreds of ribbons over large areas. Dr Loren Picco, Co-Author, Physics, VCU. While continuing to research the core properties of the nanoribbons, the team plans to also investigate their use in electronic transport, energy storage, and thermoelectric devices through new global partnerships and by working with professional teams across UCL. The research was sponsored by the Engineering and Physical Sciences Research Council and the Royal Academy of Engineering.